'Tis the Season to Be Merry and Gay! Virgin Mobile has launched its holiday ad campaign, quasi-humorously titled Chrismahanukwanzakah. 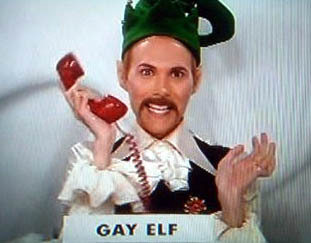 In one commercial, we see several "holiday minorities" (Hindu Santa, Buddhist Cowboy, and Jews) conducting a telethon; also working the phones is the somewhat frightening Gay Elf, pictured above. Here on Fag Island, we totally forgot Gay Elves were minorities.